A theater play was performed by a local theater group called Pirbhat. 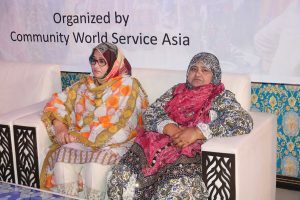 Sayyada Banu, Additional Director Social Welfare Sindh and Nafisa Qurban, Deputy Director Social Welfare, graced the event as Special Guests. Kiran Bashir, Project Manager, gave a brief introduction of Community World Service Asia and Every Voice Count Project. “Think equal and give equal opportunities for speedy development process.” Shagufta, a professional advocate and an active social worker. 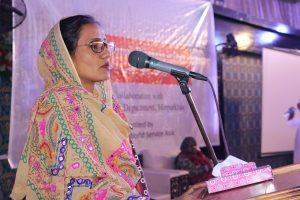 Advocate Nusrat Miyano shared her views at the district level event. “My message to all women is to stop being afraid and come forward to bring positive change in our society.” Koshaliya, an artisan in Umerkot since 2015 under the livelihoods project. Sayyada Bano, Additional Director Social Welfare Sindh presenting Ajrak to Afroza Chohan, Incharge Women Complaint Cell. Radha Bheel, a Social Worker, congratulated all women for the achievements they have made despite the many challenges existing in the society. 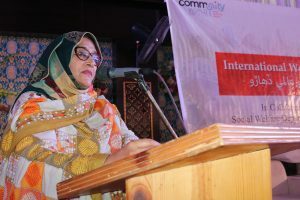 Zahida Detho, Civil Society Representative, addressing the importance of women contribution at the International Women’s Day event. 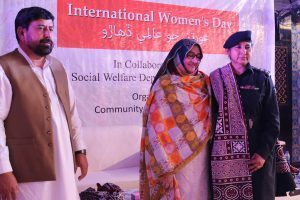 Sayyada Bano, Additional Director Social Welfare Sindh, appreciated CWSA for organizing a district level event and assured government’s support in future events like this. 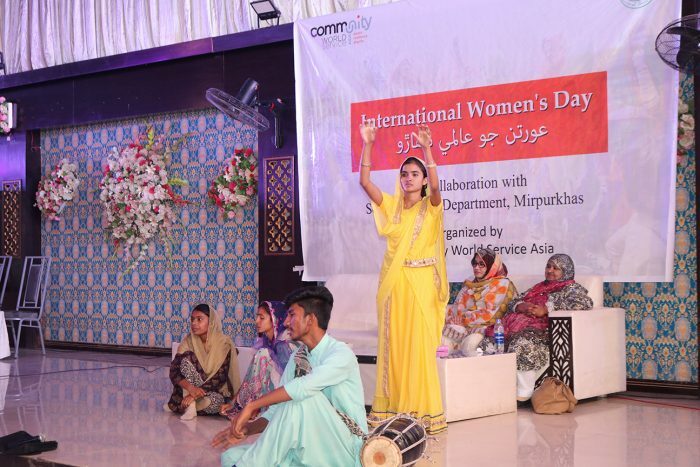 A district level event to commemorate International Women’s Day was held with participation of local communities, humanitarian and relevant government body representatives on the 28th of March (2019) in Mirpurkhas. This event, with an attendance of over two hundred participants, was organized by Community World Service Asia’s team under its Gender Mainstreaming project in collaboration with the Social Welfare Department of Mirpurkhas. 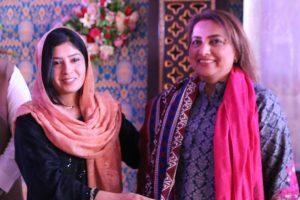 Sayyada Banu, Additional Director of Social Welfare Sindh, and Nafisa Qurban, Deputy Director of Social Welfare, Sindh, graced the event as special guests to applaud and promote the accomplishments of Sindh’s rural women. Other guests at the event included representatives of District Information, District Bar Association, District Council, the Police Department, and the District Municipal Department. Agha Sardar, Project Officer at CWSA’s Umerkot office, welcomed the guests and shared the objective of the event, which was to congregate different people from different segments of life to honor and acknowledge the contribution of rural women towards the development of a prosperous and empowered society. said Kiran Bashir, Project Manager, CWSA, as she addressed the audience while briefly introducing the project as well. 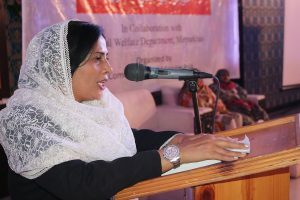 Sumaira Baloch, an active Social Worker in Mirpurkhas district, spoke on the topic too. Women have been created beautifully. They can work as hard as men. However, women face many challenges due to which they often lack behind in different fields of work. Every day should be celebrated as women’s day, to highlight these challenges and the remarkable ways in which women can and do overcome these challenges. Issues such as harassment at work, domestic violence and discrimination require immediate attention and action plan. We need to honor and respect women who choose to come out of their homes and work and allow them opportunities to work along with men with pride and honor. I am pleased to be part of this event which honors the contribution of women towards the betterment of the society. I truly believe in both genders thinking and working together for a successful development process. As member of the District Engagement Group (DEG), working under the EVC Project, we aim to listen to the voices of marginalized communities. We want to ensure that no one is left behind. 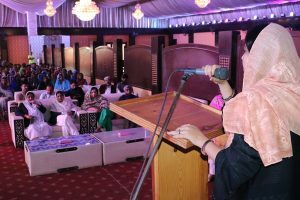 Nusarat Miyano, a vigorous social worker in Mirpurkhas shared the everyday challenges a woman faces as a housewife or as a professional. She talked of the harassment that young girls and woman face at educational institutes and workplaces as a key challenge. It is important to build awareness regarding the existing laws in the country that protect women. Sessions must be held so that women can fight for their rights to overcome these challenges. As part of the event, a theater play was performed by a local theater group called Pirbhat. The play highlighted the essential role of women in decision-making, especially in matters related to child marriages, girl’s education and economic empowerment. 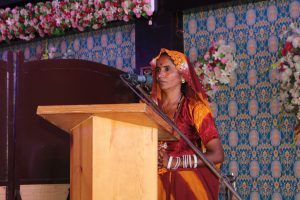 Koshaliya, an artisan in Umerkot since 2015, was invited on stage to share her views of women empowerment. CWSA gave me an opportunity, such that most women of our community can only dream of. Their livelihoods team facilitated us with a six months vocational and adult literacy training. My life changed dramatically after that. I became a Sales Marketing Agent and received other trainings on skill development as well. I visited Karachi, Lahore and Islamabad to promote our handicrafts. Our products were appreciated at national level as they were exhibited through exhibitions and fashion shows. We are continuously getting orders of embroidered apparel with the support of the CWSA. As a result, more than a thousand women, residing in remote villages of Umerkot, have become economically stronger and are supporting their families in many different ways. 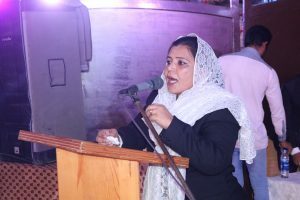 Radha Bheel, another local social worker, congratulated all the participating women for their numerous achievements, despite the many social and cultural hindrances they face in their communities. We live in a male dominant society, where it is difficult for a woman to even move freely. In a world like this, I commend the women of today for the many achievements they have made. This shows that women have the capabilities and talent to prove that they can achieve the impossible. This was followed by a screening of a short video case story that demonstrated the skill building journey of the artisans and how that eventually lead to the launch of commercial handicrafts brand, called Taanka, for them. Addressing the attendants, Shafique Husain Memon, Divisional Director Information Mirpurkhas, congratulated CWSA for organizing an event that appreciates women in every walk of life. He stressed on the importance of educating women. We all have the responsibility to promote the rights of women in every field and honor their contributions towards change and progress. I feel fortunate to be attending this dynamic event especially organized to celebrate International Women’s Day. Women play a strong role along with men in building a harmonious society. However, there is need for women to participate freely and openly. The Sindh Government is making efforts to protect the right of women by putting emphasis on strong implementation on laws such as Domestic Violence Act 2013. This will facilitate deprived women and protect them from the social evils. The poor condition of women living in Dar-ul-Amman has saddened me. Women are neglected, scared and tortured. It is unfortunate to see how the society, especially the male dominant segment, has dealt with this. 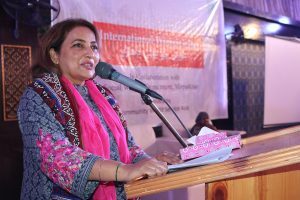 I assure you that the Government of Sindh will take strong actions in protecting women’s rights to build a safe society for women to live peacefully and freely. 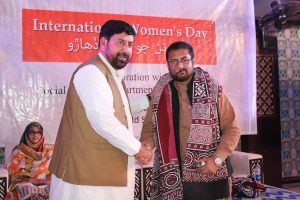 Junaid Mirza, Assistant Director Social Welfare Mirpurkhas, thanked the guests and speakers for honoring the women of today. He assured to hold and support such events with the collaboration of Government departments. Traditional Sindhi Ajraks were presented as gift to the speakers and dignitaries at the closing ceremony of the event. A local theater group formed under the livelihoods project. Members of the group were trained under the project. A shelter home for women victims of violence. Ajrak (Sindhi: اجرڪ‎) is a unique form of block printed shawls and tiles found in Sindh, Pakistan.